Compact, ultra-portable design. 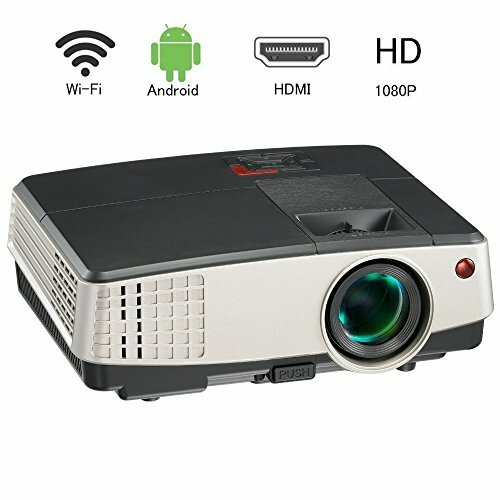 Enjoy 1080P HD video and play online games, sync the projector easily via WiFi to your IOS/Android phone or Windows device. High-speed connections without interruption with powerful 1.5GHz Quad Core CPU and 4+2 Core GPU. Share files from a thumb drive, eliminating the need for PC. Android 4.4.4 system, gives you access to over many apps including Facebook, YouTube, Hulu and more. 1GB RAM + 8GB ROM, 32GB max extended memory gives you more space to download your favorite apps and caches to browse websites, play games, run apps, watch movies more smoothly. 50% brighter than ordinary LCD projector, the mini projector projects a clear image without inflicting the same optical harm as TVs, laptops, and tablets. This technology saves your eyes while still allowing you to enjoy movies, sports, TV. Ultra low radiation led light source, even suitable for children and pregnant women. Kick back and relax with two built-in speakers which deliver high-quality stereo audio in real time, 3.5mm headphone jack for most external speakers/ headphones connectivity. Privately watch late night TV shows, movies and play games without disturbing or waking up anyone sleeping near you. Buetooth speaker requires an extra 3.5mm bluetooth transmitter. Aspect radio: 4:3/ 16:9, up to 130" big screen image. Brightness: 2600 lumens, Native resolution 1024x 600dpi, enhanced LCD display technology produce clear and vibrant images. 60HZ Refresh rate, without hysteresis,ensure you more smooth and excited gaming experience. Cheap price, accompany for years- LCD TFT with 50000 hrs life span LED lamp as light source,about 0.1USD/day.The LED is also 100% free of mercury and, as the bulb never needs to be replaced, there are no discarded bulbs. If you have any questions about this product by EUG, contact us by completing and submitting the form below. If you are looking for a specif part number, please include it with your message.